Visiting Safaris and Pakasaivo will get you outdoors. 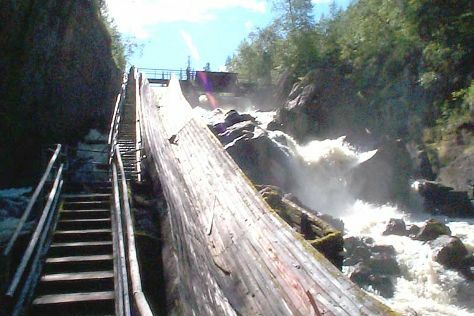 Step off the beaten path and head to Pallas-Yllastunturi National Park and Ounaskievari Reindeer Farm. Explore Levi's surroundings by going to Akaslompolo (Scandinavian Adventures & Akaslompolo Sportshop). There's more to do: make a trip to Giewont Husky Adventures and experience rural life at Santa"s Cottage & Pet Farm. For traveler tips, maps, more things to do, and other tourist information, read our Levi trip planner . New York City, USA to Levi is an approximately 20.5-hour flight. The time zone changes from Eastern Standard Time to Eastern European Time, which is usually a 7 hour difference. Expect a bit cooler temperatures when traveling from New York City in March; daily highs in Levi reach 31°F and lows reach 16°F. Finish your sightseeing early on the 13th (Wed) so you can drive to Rovaniemi. On the 13th (Wed), stop by Your Piece Of Finland. On the 14th (Thu), you'll have a packed day of sightseeing: look for all kinds of wild species at Wildlife Areas and then take in the dramatic scenery at Auttikongas. To see traveler tips, more things to do, photos, and tourist information, go to the Rovaniemi itinerary planner. You can drive from Levi to Rovaniemi in 2.5 hours. Another option is to take a bus. In March, plan for daily highs up to 30°F, and evening lows to 17°F. Wrap up your sightseeing on the 15th (Fri) early enough to travel to Helsinki. Explore hidden gems such as Sipoonkorven Kansallispuisto and Ekenas Archipelago National Park. Next up on the itinerary: test your problem-solving skills at popular escape rooms, take a stroll through Ullanlinna, admire the landmark architecture of Pohjolan toimitalo, and take an in-depth tour of Seurasaari Island and Open-Air Museum. To find more things to do, ratings, traveler tips, and other tourist information, refer to the Helsinki trip itinerary builder tool . Traveling by flight from Rovaniemi to Helsinki takes 4 hours. Alternatively, you can do a combination of train and flight; or drive. Traveling from Rovaniemi in March, expect Helsinki to be somewhat warmer, temps between 37°F and 23°F. Finish up your sightseeing early on the 18th (Mon) so you can travel back home.